Could there be anything more exciting than the opportunity to post a whole new test (eight looks, of which four are featured here) starring plus-size model Kelsey Olson? For months, Kelsey's ardent fans--among whom ever aficionado of timeless beauty is numbered--have been clamouring to see a new test from their beloved fair-haired goddess, and Miss Olson does not disappoint. Her new shoot, by acclaimed Seattle photographer Elke van der Welde, is a stunning collection of captivating looks, a virtuosic fantasia in a host of emotional keys. 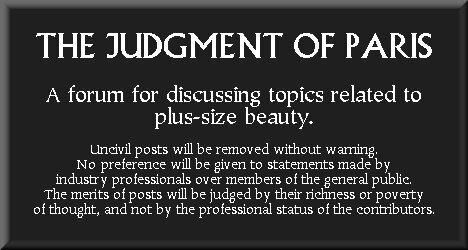 We at the Judgment of Paris are privileged to have been granted exclusive permission to share these images with the public. No words are sufficiently eloquent to limn Kelsey's beauty. Consider this elegant masterpiece. The model's buxom contours are evident, as is the soft fullness of her waist, along with an especially lovely detail: the dimple at her elbow. The ruffles of her top are attractively feminine, while the cardigan resembles Classical "wet drapery" in its sheer, frilly fabric. A closer look highlights the model's captivating facial expression, which communicates youthful innocence and a touch of vulnerability, a mixture of surprise and interest, as if she were caught unawares by the viewer, and now views with pleasure the effect that her beauty has upon him. Observe how her tresses flow over her neck and shoulders, and note the sensual detail of her bracelets gently pressing into the soft flesh of her arm. Transitioning into a new demeanour, Kelsey appears irresistibly pleased with herself. If we are to follow the narrative from the previous photo, the model has now noted the viewer's rapt admiration and feeds off of it, teasingly flaunting her radiant beauty. Her deep decolletage infuses the image with sensuality, as does the way in which she casually twists her golden curl over her fingers. "You know you adore me," she seems to say, with a come-hither look of invitation, her eyes heavily lidded and thus especially seductive. The fullness of her arm testifies to her opulent physique. In what is surely one of the most seductive headshots that any model has ever created, Kesley gazes upon the viewer with intoxicating vanity. Observe the attractive roundness of the model's arm (at the left, in the photo), which has been cleverly retained in the image by the photographer as a supremely sensual element. The crease of fullness at the point where the arm meets the shoulder is intensely alluring, reminiscent of the plump limbs of a newborn. With her fair tresses and baby-blue eyes, no other model possesses such adorably childlike qualities infused with the voluptuousness of a full-grown woman--thus creating a mesmerizing blend of effects. As the camera pulls back (because it could draw no closer without pressing a kiss upon the model's parted lips), Kelsey adopts a confident, hands-on-the-hips pose. Observe the absence of a visible clavicle, wholly submerged as it is in fullness at the neck and shoulder area. The most alluring element in this image is the curve of softness along the model's side, just below her bust and above her waist--a luscious element that testifies to her attractively untoned, feminine physique. Drawing back even further, the camera encompasses more of Miss Olson's figure. Notice the skillful, ever-so-slight slight twist that the model gives her body, thus attractively emphasizing her curvaceous hips. The print on the front of the model's top subconsciously echoes Kelsey's womanly form. Instead of the repulsively narrow look of straight-size or faux-plus models, Miss Olson displays a real substance to her figure, a breadth to her shape that is extremely desirable. Many of the images in this test show the model exploring passionate, alluring demeanours, but in the following picture she shows her fans the warm, gentle smile for which she is famous. Even after six years of modelling, her look is as youthful and fresh as the first blush of springtime. She glows with a healthy, natural radiance. Such beauty as she possesses could be intimidating, but she takes mercy upon the starstruck viewer and reassures him with her soft, warm, inviting expression. But sensuality is never absent in any Kelsey photograph. Note the presence of truly goddesslike physical detail--the dimples at the model's knuckles. The age-old tradition of gentlemen kissing ladies' hands originated precisely because of the male impulse to pay tribute to princesses whose soft hands display this seductive feature. Fans of Kelsey who remember her innumerable modelling stints for Torrid will recall how widely her looks varied from shoot to shoot, simply via a change of hairstyle or lip colour. So too in this test, with her deep red lips, does Miss Olson suddenly appear more carnal, more dangerous. Yet instead of defaulting to the obvious choice, a "raw" demeanour, Kelsey takes a more creative approach, striking a look of refinement and sophistication. She personifies a civilized temptress, a cultured femme fatale. The focal point of interest in the image is, of course, her luscious arm, which appears full and rounded, and even displays a stunningly sensual detail--the dimple at the elbow. Kelsey has a unique ability among models to show how class and poise can blend with gentle softness and physical fullness, thus demonstrating that a woman need not appear "hard" to be chic, but can remain girlish, even in a cultured context. A fourth look shows Kelsey channelling Old Hollywood glamour in presenting herself as a silver-screen starlet of the 1930s. Observe how sinuously she curves her shapely figure. With this pose, she reaches the very zenith of the modelling art: the ability to evoke an emotion, a persona, simply by the positioning of her body. Her leisurely, sensual stance creates a feeling of intoxicating languour, of self-satisfied indolence. She appears to be a goddess who has never exerted herself in any way, but has lived a life of pampered ease and luxury. She lazily displays her round, full arms, knowing that the mere sight of her well-shaped limbs will inflame every viewer's desire. This alluring indolence is amplified by her seductive, heavily-lidded gaze, a look that smoulders precisely because it appears so passive. Every red-blooded man in the world would dream of bestowing upon her the creature comforts that she loves, giving her the life of luxury and ease to which she is accustomed and to which her staggering beauty so richly entitles her. With her fair, flawless complexion, the light reflecting off of her luminous skin, she displays a quality that silver-screen cinematographers once described as being "lit from within." Another image in the same outfit is, astonishingly, even more alluring. No longer indifferently positioning herself for the viewer's admiration, now the model presents herself before him, provocatively displaying her abundant curves. The open neckline of the top subconsciously invites his worship. Consider how much more boldly the model flaunts her sensuality by subtly altering her pose from the previous stance. Her allure is so overwhelming that it becomes a challenge to the viewer: Do you dare approach a goddess such as this? Could anyone be worthy of engaging her interest? If the model's love of sensual idleness and languour were evident in the previous, arms-extended stance, then in this photograph she discloses her appetitive nature. She knows that all that she has to do is turn up the heat a hair's breath, with just one steamy glance, and any man in the world is hers for the taking, becoming her lovestruck slave. But Kelsey, brilliant model that she is, can turn emotionally on a dime. In a unique, extraordinary volte face of the kind that only the finest models can achieve, she adopts a causal, playful, girl-next-door friendliness in the very next image. Notice, however, that although her demeanour is reassuring and approachable, her seductiveness is as great as ever, for the slight twist of her body prominently showcases her opulent voluptuousness. Indeed, the model seems amused at how effortlessly she has befuddled the viewer, emptying his mind of all thoughts but the worship of her beauty. Silver-screen starlet though Kelsey may be, her fans still prefer to see her in colour, inasmuch as colour photographs display her peaches-and-cream complexion, fair eyes, and princess-like golden hair. In an ensemble that is itself black and white, the viewer's eye is arrested by the one splash of colour--her bright red lips. This image features a subtle sensual element of its own: the fullness of the model's arm at her right wrist (on the left-hand side of the image), which displays a swell of softness that again echoes the limbs of a newborn. Notice how the model positions her head to one side, her arm to the other, thus creating a visual balance, with her buxom decolletage in the centre of the image, stopping the viewer's heart. Her demeanour here is not as steamy as in the first two images in this outfit, nor as casual as in the third, but finds a midpoint that shows interest and engagement with her rapt audience. Even her hand suggests a beckoning gesture, her stance being one of invitation and availability. Among currently working plus-size models, Kelsey Olson is in a league of her own. No other model introduces so many layers of meaning in her photographs, nor explores such a range of emotions and expressions. She can be childlike and innocent in one image, then appear mature and sophisticated in another, then transform herself yet again and exude carnal appetitiveness. Yet the consistent element uniting all of her work is her soft, fair beauty, which endows her with a naturally gentle look, a look that is the essence of true femininity. It is a type of distinctively Nordic beauty that is actively suppressed in modelling, and defamed in Hollywood, yet it embodies the true ideal of female loveliness which resides in the human heart. Fans of Miss Olson will be even more thrilled with the second installment of our two-part celebration of the model's latest test, as it will feature four looks that are even more sensual than these, including a presentation of . . . intimate apparel. Will your heart be able to stand such excitement? If not, then be comforted by the notion that passing beyond the veil with Kelsey as the last vision that your living eyes behold would surely be the most agreeable of all ends. - Our Kelsey Olson profile . . .
Last edited by HSG : 4th October 2010 at 01:32. Every time I see new pictures of Kelsey Olson, she becomes more gorgeous. I always think, "This, now, is the prettiest that she can ever be," yet she always transcends herself. She IS the most beautiful model in the industry today, with only Shannon Marie as her equal. I love her best with her long golden tresses down, but in these pictures she proves that she is every bit as stunning with her hair pulled back. Every single photo in this thread is breathtaking, but I especially adore the vulnerability that she expresses in the first image. That vulnerability is something that Kelsey evokes better than any other model, and it immediately draws you into her pictures. You want to cherish her and protect her. But above all, I love the fact that she matches her gentle femininity with a genuinely full size-16 figure. 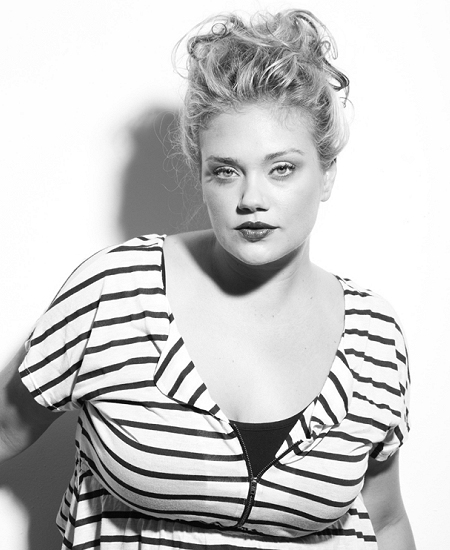 She is a true plus-size model, and far more inspirational for that reason than any of the smaller faux-plus girls. She proves indisputably that you can be visibly curvy and also be the most beautiful woman there is. She's utterly amazing. An angel. Kelsey brings to life every illustration or painting that I've ever seen of angels. There has to be a reason why angels are always depicted with her appearance -- it must speak of something universal to all humanity, an archetype that we all share of ideal feminine beauty. How extraordinary that Kelsey embodies that archetype so perfectly. What I find remarkable is that while Kelsey is so seductive and alluring, her images are extremely tasteful and classy, without even the slightest hint of vulgarity, but rather a wholesome kind of sexiness. Her images evoke both sacred thoughts and profane thoughts at the same time, with each impulse enriching the other -- never so sacred as to be dull, and never so profane as to be excessive, but a blending of the best of both qualities together in the same pictures. The loveliest of faces with the most beautiful of figures; Kelsey is ideal. With her fair, flawless complexion, the light reflecting off of her luminous skin, she displays a quality that silver-screen cinematographers once described as being "lit from within." That image is simply phenomenal, as is every other picture in this thread. But that one in particular is so haunting. I agree that Kelsey looks most gorgeous in colour photographs, but that image epitomizes silver-screen glamour. Her pose is so graceful, like a Classical sculpture. And oh, that face! I wish we could see a close up of her face in that photo. The expression is unlike any other that I've ever seen Kelsey adopt before. It's so sultry and dreamlike, like an alluringly spoiled, regal goddess. There is no doubt about it -- Kelsey is the most gorgeous model in the industry right now. No one else can touch her. It's not just that she is the most attractive (although she is). She also has that unique gift of being able to present her loveliness in such a way as to evoke the deepest feelings in the viewer, to affect them in subconscious ways. That's the difference between a model and simply a very beautiful girl -- a great model is beautiful, yes, but she also transmits that beauty through the camera lens, right to the viewer's heart and soul. That's what Kelsey accomplishes with every unforgettable photo. I'd love to see her grow her hair all the way down to her waist, like the true storybook princess that she is, or at least halfway down her back. I especially adore the fact that she has such a soft physique, not artificially "toned." That makes her very feminine and natural, and increases her appeal even more. Kelsey's pictures are magical. I've been lurking at this site for a long time now, and anytime I've seen threads with new examples of her work, I've always clicked on them eagerly, because her images have always epitomized true feminine beauty. By the way, I remember reading in the Kelsey Olson interview on this site that her beauty was artistically inspiring - like that of a classical muse. Well, I came across something the other day that confirms this. Model Kelsey Olson, one of the inspiration sources for Gabrielle, the main character of Winterheart (NaNo 2010). Isn't that wonderful? Not only is it exciting to see an author inspired by Kelsey's beauty, but it's also a pleasure to see her openly note Kelsey's measurements and indicate that her size-16 figure is a principal aspect of her beauty. I'll be intrigued to see what type of character Kelsey's images inspire.